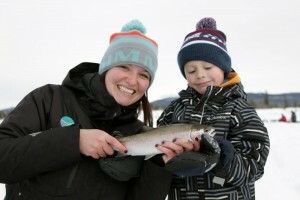 Ice fishing on Tunkwa has been a bit spotty the past week. Lots of trout down there coming in to look, but very tough to get them to bite, and when they do hit, it’s often very light. 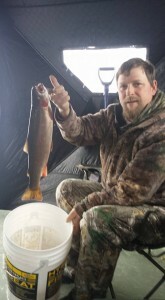 Still, trout are being caught, low light periods being the best. Ed and Layla Thomson show how it’s done, nice fish! 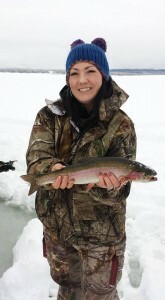 Jessica’s all smiles with her first trout through the ice!